Likely Part of the BC Adventure Network. Over a million web site visitors annually ! One of the few remaining Cariboo Gold Rush settlements, Likely, British Columbia, is a small community situated where the west arm of Quesnel Lake empties into the Quesnel River, near the southern end of the Matthew River Road leading to Barkerville. Quesnel Lake is the largest lake in the Cariboo, with more than 500 km of scenic shoreline. One spot in the lake is over 610 metres deep. Likely, at the west end of the lake, was originally called Quesnel Dam. The name was changed to honour John A. Likely of the Bullion Pit Mine, who was affectionately called "Plato" for his tendency to philosophise. 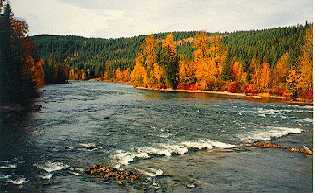 In 1898 the Quesnel River was dammed near Likely to enable down river areas to be explored for gold. During the last week of October in 1922, more than 697 ounces of gold were recovered at the Cedar Creek Mine. In 1935 the Bullion Pit became the site of the largest hydraulic monitors ever installed in North America. It operated from 1892 to 1942, constructing over 64 kilometres of canals to draw water from nearby lakes and creeks to feed the hydraulic nozzles. In fact, Morehead Lake was created to supply water to the Bullion mine. Today, the Bullion Pit stands as an astonishing man-made canyon which can be viewed from the trail above. Just over the hill from Likely is the ghost town of Quesnel Forks. At one time, one of British Columbia's largest communities, now a collection of historic buildings where the Cariboo and Quesnel rivers meet. A lovely setting for a picnic in a spot where time stands still. Plan a visit to Likely in late August and watch thousands of salmon migrate up the Quesnel River to their spawning grounds in the Horsefly and Mitchell Rivers. Be sure to visit Cedar Point Park, an impressive stand of yellow cedar on the shores of Quesnel Lake. Once a rendezvous point for the Hudson's Bay fur brigade in the 1850's, Cedar Point is now a park and campground. Access: Likely, British Columbia, is located 85 km (53 mi) east of 150 Mile House off BC Hwy 97 on the Likely Road. Accommodations: Motel rooms are available in the community, as well as several nearby lakeshore cabins and resorts on West Quesnel Lake and Morehead Lake. Campsites: Cedar Point Park offers lakeshore campsites with no hookups; A Forest Service campsite is located north of Likely on Cariboo Lake; Camper/trailer hookups are available at nearby resorts.